Santa's List [W5238] - $8.50 : Yarn Tree, Your wholesale source for cross stitch supplies. Cross stitch pattern by Country Cottage Needleworks. Did you hear?!?! Santa Claus is coming to town! You better make sure to add "Santa's List," to your Christmas list! 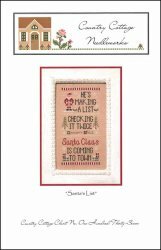 "He's making a list, checking it twice, Santa Clause is coming to town," is stitched down the middle of the design. Santa, Christmas presents, pine trees & snowflakes decorate the outer edge of the saying. Turn on "Santa Claus Is Coming To Town," as you stitch this design! Stitch count 71w x 136h.